SOCHI: Edinson Cavani scored twice as Uruguay shattered Cristiano Ronaldo’s World Cup dream with a 2-1 victory over Portugal here yesterday. Paris Saint-Germain striker Cavani curled home a superb 62nd-minute winner to settle a thrilling second round duel in Sochi which sends Uruguay into a quarter-final against France next Friday. Cavani had already put Uruguay in front early on, only for Pepe to head Portugal level in the 55th minute in a thrilling contest that was not the battle of attrition many predicted. Pepe’s goal was the first time the South Americans’ defence had been breached in this tournament, but they stood firm after that and are beginning to look like genuine contenders moving into the latter stages in Russia. The only downside for Oscar Tabarez’s side was the sight of Cavani limping off late on, raising a question mark over his fitness for next week’s last eight showdown with the French in Nizhny Novgorod. Meanwhile, European champions Portugal go home, as Ronaldo and Lionel Messi bow out of the competition on the same day. In contrast, Uruguay march on with arguably the best defence in international football and one of the best strike pairings anywhere. Suarez and Cavani combined brilliantly for the seventh-minute opener on Russia’s Black Sea coast. Cavani picked out Suarez on the left with a cross-field ball, before continuing his run into the penalty area and meeting the Barcelona striker’s return delivery at the back post, the ball smacking off his face and flying in. Suarez almost doubled the lead from a free-kick midway through the first half that forced a good save from Rui Patricio. Meanwhile, Ronaldo did not touch the ball once in the opposition area in the first period. But with Uruguay sitting back, Portugal did equalise 10 minutes into the second half. After nearly five and a half hours of football, it was the first goal Uruguay had let in at this World Cup-indeed it was the first they had conceded in 2018. 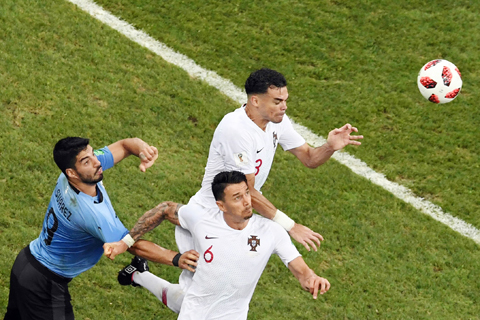 Portugal coach Fernando Santos threw up his hands in disgust, realising that coming from behind a second time against this Uruguay defence was going to be a tall order. Goalkeeper Fernando Muslera did almost gift them another equaliser, dropping a high ball at the feet of Bernardo Silva, but the Manchester City man could only volley over.